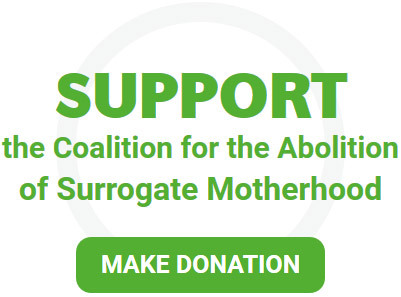 Substitute motherhood, or surrogacy, which is practised in several countries, is the loaning of women’s bodies in order to give birth to children who will be handed over to those who ordered them. Far from being just an individual act, this social practise is orchestrated by human reproduction companies, in an organized production system involving laboratories, doctors, lawyers, agencies etc. This system needs women as means of production, so that pregnancy and childbirth become a functional process that has a use value and a commercial value and is part of the globalization of human body markets. In countries where no law protects them, women’s bodies are turned into resources for the reproduction industry. Some women consent to enter into a contract which will alienate their health, their lives and their selves, under multiple pressures, family or gender based, economic, or geopolitical.